Image: (c) Laure Cops, Wouter Vanmol and Berber Verpoest. This Tuesday, the World Bank approved two $400m loans to Azerbaijan and Turkey to fund the construction of the Turkish section of the Euro-Caspian Mega Pipeline pipeline called TANAP. Today, the Asian Infrastructure Investment Bank is due to discuss another loan to TANAP. (Update: loan approved.) This comes a week after the Asian Development Bank (ADB) approved a controversial $1bn loan to the Azerbaijani gas field that will feed the pipeline. These bank loans are being considered despite an alleged corruption scandal involving the bribery of Council of Europe MPs by Azerbaijan in 2013. As the Italian courts have recently uncovered, this was likely in exchange for voting against a key report on the country’s political prisoners. The Euro-Caspian Mega Pipeline is a very important project for Azerbaijan, BP and the UK. A gigantic piece of fossil fuel infrastructure, it will run over 3,500km to bring gas to Europe from the BP-operated Shah Deniz fields off the coast of Azerbaijan. It will thus further entrench the Azerbaijani regime financially and politically. The scheme, which has been under discussion since 2000, was described by BP CEO Bob Dudley as “one of the largest and most complex... undertaken by the global oil and gas industry”. 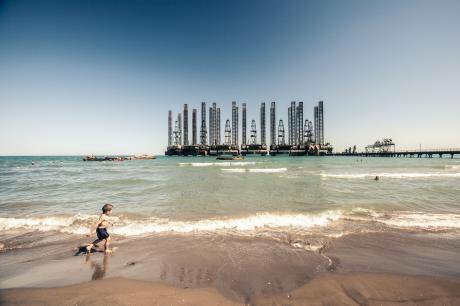 Ilham Aliyev’s regime, which has ruled the fossil fuel-rich Azerbaijan for 23 years, and BP have been bound together since 1994, when they signed the “Contract of the Century” to extract oil from the Caspian Sea. Aliyev’s corrupt and repressive regime is underpinned by oil and gas revenues — $48 billion of $135 billion in state revenues from oil has been diverted to offshore tax havens. To date, BP has sunk $10 billion into the initial development of the Shah Deniz Field from which the gas will be sourced. In the wake of the Deepwater Horizon disaster, BP sold off $40 billion worth of assets from Egypt to Vietnam, from the USA to Russia. But it maintained its investment in Azerbaijan even as other international oil companies pulled out. BP is also the largest non-Azeri stakeholder in the pipeline as it runs from Turkey to Italy. The company will suffer a substantial financial blow if it was unable to realise its investment. By approving the loan, the World Bank will not only directly contradict the climate goals that it and other European public banks committed to in Paris last December, but it will also contravene its own safeguard standards by supporting controversial regimes — Azerbaijan and Turkey. In Turkey, where Recep Tayyip Erdoğan’s control of the press is significantly limiting freedom of speech, TANAP crosses Kurdish regions that are currently affected by an escalation of violence following the breakdown of peace talks in July 2015. In Azerbaijan, there are currently about 100 prisoners of conscience, including Bayram Mammadov and Qiyas Ibrahimov, N!DA youth movement activists, and journalists Ikram Rahimov and Afgan Sadigov. The situation of prisoners like these was the subject of the Strasser report that is in the middle of the alleged corruption story at the Council of Europe (CoE). The CoE, Europe’s “leading human rights organisation”, monitors the 47 member states, focusing on human rights, civil rights, the justice system and corruption. Azerbaijan knows that a conviction in any of these areas would be bad for business. So it was handy that in January 2013, the CoE voted against the publication of a key report on political prisoners in Azerbaijan drafted by MP Christoph Strasser, who was denied entry into Azerbaijan to carry out his investigations. But in late 2016, Luca Volontè, a former member of the Union of the Centre Party in Italy, and president of the European People's Party in the Council of Europe, was charged by Milan Public Prosecutor's Office for allegedly accepting a €2.39 million bribe from the government of Azerbaijan in exchange for persuading the People’s Party to vote against this report. The publication of Strasser’s report would have invited public scrutiny of corruption, repression, and human rights abuses in Azerbaijan, creating challenges for the Euro-Caspian Mega Pipeline to be approved and financed. The bribe was made possible through a complex money laundering web. Between 2013 and 2014, four British companies (called LCM, Hilux, Polux and Metastar) paid money to Volontè. They are all controlled by joint stock companies located in Belize, the Seychelles and the British Virgin Islands, offshore tax havens. The companies paid €390,000 for advice that Volente personally provided to Elkhan Suleymanov, a good friend of president Aliyev, and the head of the Azerbaijani lobby in the Council of Europe in Strasbourg. Another €2m was paid to Volontè’s foundation, Novae Terrae, with a further €8m was promised over 10 years. That the Azeri state is involved in dark webs of corruption and repression comes as no surprise to those who follow affairs in Azerbaijan. When the Panama Papers scandal broke, Azerbaijan’s president Ilham Aliyev was one of the 11 heads of state named. Through the Mossack Fonseca law firm in Panama, the Aliyev family controls mobile phone companies, the Azerbaijani bank Atabank and six gold mines in Azerbaijan. Just 24 hours before the scandal hit headlines in April 2016, Azerbaijan’s special forces attacked Nagorno Karabakh, a disputed independent territory within Azerbaijan home to 150,000 people, mostly Armenian, leaving hundreds dead, and diverting attention from the ruling elite’s complicity in the Panama Papers controversy. Indeed, until recently the number of prisoners of conscience included journalist Khadija Ismayilova who discovered the Aliyev family is siphoning off state revenues from oil into Panama. The current court case in Milan focuses on one Italian MP, but other MPs also voted against the Strasser report, preventing investigation and official reports on the Azeri situation from getting out. The UK, especially, is a key ally of Azerbaijan in the Council of Europe — former UK MPs Mike Hancock and Robert Walter voted against Strasser’s report at the Council of Europe. Freedom of speech and basic civil rights are a concern in Azerbaijan for several years. The Council of Europe’s unfolding corruption scandal exposes just how important it is for the Azeri state to divert attention from the severity of the crackdown against civil society in the country. Azerbaijan was also downgraded within the Extractive Industries Transparency Initiative (EITI) in 2015 from full membership. Several IFIs, such as the EIB, the EBRD and the World Bank Group have de facto made approval of financing for Azeri gas projects and related pipelines conditional to the implementation by the Azeri government of corrective measures requested by the EITI. By approving this loan on 20 December, which is before Azerbaijan has completed implementing EITI’s recommendations, the World Bank has broken this consensus, turning a blind eye to corruption and repression. Plans for a new Euro-Caspian pipeline will solidify the west's dependence on fossil fuels and authoritarian regimes. This new documentary shows why we should stop and think.